Karelian birch is a tree with presented by nature amazing pattern of wood that looks like marble. 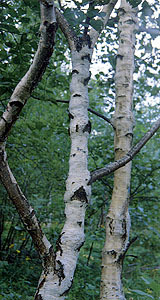 It is different from an ordinary birch by its trunk that not so slender as latter and knobs and excrescences abundantly cover its surface. Karelian birch grows up slower than an ordinary birch and own characteristic features can evince not always early in its life but few tens years later and also after a number of years these features intensify. Only from 30-40 percents of seeds in result grows tree with Karelian birch's features. This very ordinary birch grows from the others.